Elementary teachers are under tremendous time pressure, especially with the current emphasis on preparing for standardized tests. Working through the four lessons in an Engineering is Elementary unit takes about six to ten hours of class time. When I facilitate EiE workshops, teachers often ask me: “Do I HAVE to teach all four lessons? What if I just skip to Lesson 4?" . . . which is the engineering design challenge, where kids design, build, and test a technology, such as a solar oven or water filter. In our Teacher Educator Institutes, we ask participants to skip to Lesson 4 deliberately, as a learning experience. 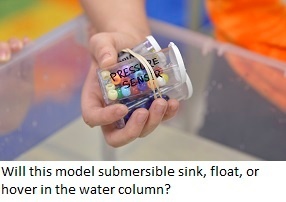 I recall one workshop where we started with Lesson 4 from our “Designing Submersibles” unit; the challenge is to make a model submersible from small plastic vials that contain sand, beads, or marbles. The lessons in every EiE unit are carefully scaffolded. If the workshop participants had started with Lesson 1, they would have read a storybook about a girl who goes snorkeling with a friend and, when the friend loses her diving goggles, designs a submersible to retrieve them. 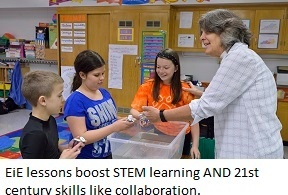 In Lesson 2, they would have learned about the field of ocean engineering, and the kinds of technologies engineers design for ocean exploration. 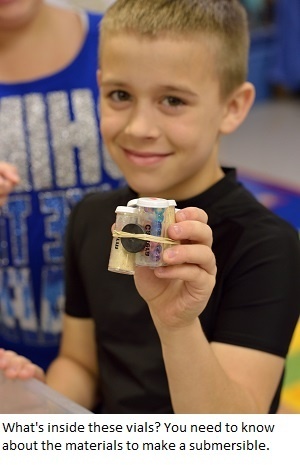 In Lesson 3, they would have systematically tested the different materials for making a model submersible—making connections to their pre-existing science knowledge about how mass and volume influence floating and sinking. But we started with Lesson 4, and that was deeply frustrating for the participants. Without the context of the preceding three lessons, the design challenge seemed abstract: What’s a submersible? How do they work? Why would you need one? What’s up with these vials? How do we know which vials will float and which will sink? One teacher was so upset, she was ready to walk out—until we reminded her this was an exercise in understanding how your students will experience this challenge IF you don’t build the proper background. The next step was to ask our participants, “What do you wish you’d known BEFORE you started the challenge?” The teachers generated a big list of questions—all of which get answered as you work through Lessons 1, 2, and 3. We can’t insist you teach all four lessons, but we strongly recommend it. You’re not taking time away from math and literacy; you’re creating valuable opportunities to apply and consolidate skills in these subject areas. And learning with EiE builds 21st century skills that standardized tests DON’T measure, like critical thinking, problem solving, creativity, communication, and collaboration. You could read the Lesson 1 storybook during your ELA period. (Note that your Teacher Guide has a vocabulary list and three question sets—pre-reading, during reading, and reflection). In Lesson 4, students work through a five-step engineering design process (ASK – IMAGINE – PLAN –CREATE - IMPROVE); the “IMAGINE” step is an individual assignment, not a group activity, so you can have your students do it as homework, rather than in class. Do you have a classroom tip to share with other EiE teachers? Please let us know.